Here are some Alums of the Baylor bassoon studio! Rachel Frederickson is an active bassoon private teacher and reed maker from Texas. Rachel Frederickson received her bachelor’s of music education and bachelor’s of music performance from Texas Lutheran University in Seguin, TX under the direction of Dr. Mark Rogers. While she was there, she had the opportunity to play with the Mid-Texas Symphony, Corpus Christi Symphony, Victoria Symphony, and Kingsville Symphony alongside Dr. Rogers. She also played in his community band, the Heart of Texas Concert Band in their 2013-14 season while she taught 5th-12th music/band in Nixon-Smiley CISD. In May 2017, she graduated from Baylor University with her masters in both music education and bassoon performance studying with Dr. Ann Shoemaker for all three years. While studying at Baylor, she had the privilege of performing in masterclasses with Marion Reinhard, Jeff McCrary, Martin Kuuskmann, Kathleen McClean, and Billy Short. In the the summer of 2016, she had the opportunity to attend the Brevard Music Center Festival in Brevard, North Carolina where she studied with Prof. William Ludwig, and Dr. Sue Barber. Currently, she is a Graduate Assistant receiving her doctorate in Musical Arts with the focus of Bassoon Performance under the direction of Dr. Michael Kroth. When she isn't practicing or studying, she is playing with her 8 basset hounds and 4 cats at her parents' house in New Braunfels, TX. Richard Beene, Dean and Chair of Winds Department and bassoon instructor, Colburn School of Music. Richard Beene enjoys an active career as a teacher, soloist, chamber musician, and orchestral performer. In 2001, while serving as Professor of Bassoon at the University of Michigan, he was awarded the 2001 Harold Haugh Award for excellence in studio teaching. He has been invited to present master classes and teaching residencies at a number of institutions, including the Thornton School of Music at the University of Southern California, Rice University’s Shepherd School of Music, and McGill University, among others. He has also served on the faculties of Michigan State University and Wichita State University. In addition to performing numerous times with the Detroit Symphony Orchestra, Mr. Beene has appeared with the New York Philharmonic, the Chicago Symphony Orchestra, and the Pittsburgh Symphony Orchestra. While maintaining his teaching schedule in Michigan, he also held the position of Principal Bassoonist with the Toledo Symphony Orchestra, where he performed many times as a soloist. Additionally, he has toured Europe as a soloist with the American Sinfonietta and performed as a soloist at the Festival de Musique de St. Barthelemy in the French West Indies. Summer festival engagements have included the Sunflower Music Festival in Kansas, the Basically Bach Festival in Anchorage (Alaska), the Colorado Music Festival, Strings in the Mountains (Colorado), the Arkansas Music Festival, Washington's Centram Chamber Music Festival, the Bellingham Festival of Music, and the Peninsula Music Festival (Wisconsin). Chamber music and recital engagements have taken him to New York's Merkin Concert Hall and the Library of Congress in Washington, D.C., as well as venues throughout Germany, Switzerland, Italy, and Austria. Mr. Beene has also been a featured recitalist at the annual convention of the International Double Reed Society. 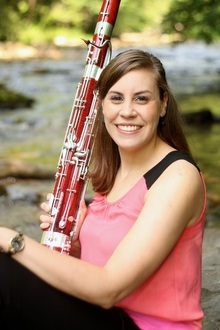 Jenny Mann is Assistant Professor of Bassoon at The University of Alabama. She is also Principal Bassoonist with the Tuscaloosa Symphony and an active performer in regional orchestras and chamber ensembles. In addition to her teaching, Dr. Mann coordinates the thriving Chamber Music Program at The University of Alabama, which incorporates extensive educational outreach experiences. Dr. Mann is a member of the Cavell Reed Trio and Capstone Woodwind Quintet that perform around the country and are committed to furthering both genres through the commissioning of new works and recording. In evidence of this commitment, “The Art of Collective Invention,” a new recording by the Cavell Trio, was released in April 2012 by Blue Griffin Records. The disc includes both premiere recordings and centerpieces of the genre. It is currently available at blugriffinrecords.com, amazon.com and the iTunes music store. The trio recently began a commissioning project of contemporary American composers that will culminate in the next recording project for the group. Dr. Mann has performed throughout the country as a chamber musician and soloist, including the 2011 and 2012 International Double Reed Society Conferences, and the 2012 International Clarinetfest and National Flute Association Conferences. She has performed with the symphonies of Alabama, San Antonio, Syracuse, Austin, and Huntsville and as a soloist with the Tuscaloosa Symphony and the Hot Springs Music Festival Orchestra. Dr. Mann is also the bassoon mentor at the Hot Springs Summer Music Festival, as well as a member of their chamber music series. See www.hotmusic.org for more information. In addition to performing and recording, she is currently working with Mountain Peak Music on their new hybrid educational resource Teaching Woodwinds. This is an exciting educational method designed for both collegiate and beginning musicians. Resources include both printed and online materials, audio and video examples, as well as a membership to the website. Teaching Brass, the first installment in the series, is available at www.mountainpeakmusic.com. Teaching Woodwinds will be available in 2013. Dr. Mann studied with Kristin Wolfe Jensen, John Hunt, David Van Hoesen, Jennifer Speck, Kent Moore and Janis McKay. She holds a Bachelor of Music Education degree from Baylor University and a Master of Music degree from the University of Texas at Austin. She began her doctoral studies at the Eastman School of Music and completed them at The University of Texas at Austin. Dr. Mann continues to be an active clinician and teacher of young musicians. Leyla Zamora, contrabassoon, San Diego Symphony. Leyla Zamora has been a member of the San Diego Symphony Orchestra since 2005. Ms. Zamora studied at the Tchaikovsky Conservatory in Moscow, Baylor University and DePaul University in Chicago. 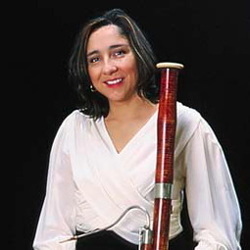 Before coming to San Diego, Ms. Zamora held for 11 years the position of principal bassoon with the Memphis Symphony. She has also performed with the Seattle Symphony, Civic Orchestra of Chicago, Auckland Philharmonia in New Zealand, Costa Rican National Symphony and Colombian Youth Symphony Orchestra. Ms. Zamora has participated in orchestral and chamber music festivals such as the Britt and Cascade Festivals in Oregon, New Hampshire Music Festival, International Orchestra in Japan, the Spoleto Music Festival in Italy, Apple Hill Chamber Music Center, Des Moines Metro Opera and Cassals Festival in Puerto Rico. Ms. Zamora has presented master classes and recitals at the Universities of Idaho, Wichita State, Southern Mississippi, University of Memphis, Washburn University in Kansas, and has performed solo concerti and recitals in Costa Rica, Colombia, Japan, Europe, and the former Soviet Union. Leslie McIlroy Massenburg, Adjunct Professor of Bassoon, Brookhaven College. Top freelancer and private teacher in DFW. Director of Bassoon Academy of Dallas. 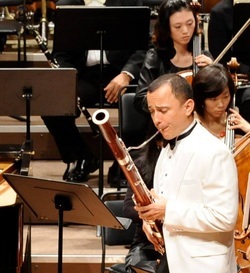 Michael Garza, Principal Bassoon of the Guangzhou Symphony, Guangzhou, China. Manhattan School of Music, DMA studies. Jennifer Lane graduated in 2014 with a degree in bassoon performance. She is currently attending the Colburn Conservatory of Music in Los Angeles, CA, working towards a masters in bassoon performance with renowned bassoonist Richard Beene. She has performed with the Baylor Wind Ensemble, Baylor Symphony Orchestra, First Baptist Church of Waco orchestra. During her time at Baylor, Jennifer has performed in master classes with George Sakakeeny, Richard Beene, Frank Morelli, Elise Wagner, Peter Kolkay and William Ludwig. Jennifer teaches bassoon privately to students year round, and teaches each summer at the Bassoon Academy of Dallas for students ranging from beginners to advanced high school bassoonists. Jennifer has attended the Colorado College Summer Music Festival and the Texas Music Festival. Sarah Highland, a graduate of Interlochen Arts Academy and McGill University, graduated with her Master of Music degree at Baylor University in 2014. Sarah’s primary instructors include Stéphane Lévesque, Eric Stomberg, and Ann Shoemaker, and she has performed with members of the Fort Worth, Montreal, Toronto, and Boston Symphonies. She has participated in many summer festivals including L’Orchestre de la Francophonie, Blue Lake International Orchestra European Tour, Interlochen Fine Arts Camp, and Orford Arts Centre. Sarah currently lives in Arlington, TX, where she is teaching privately, establishing a thriving reed making business, and freelancing in local orchestras. Don't see someone who should be here?! Contact me and I'll be happy to add them to the site.